On 26 December 2014 Russian President Vladimir Putin approved the revised “Military Doctrine of the Russian Federation.” Compared to the 2010 version, this document expanded the catalog of external threats. Among the most important of these are: “NATO capabilities (…), and its infrastructure approaching the Russian borders”, interference in the internal affairs of Russia’s allies, the growing threat of terrorism and extremism, and support for the regimes in the countries bordering Russia that came to power following the overthrow of the legitimate authorities. As the main objective of the development of the Russian Armed Forces is to transform their structure and size, and equip them with modern weapons for potential future use, so that they are able to respond to these threats. One should therefore expect further modernization of the Russian Armed Forces; on the one hand, in order to keep their deterrence potential, on the other, to ensure their readiness to act quickly and effectively in regional conflicts in the area which the Kremlin considers its zone of “special interests”. In December of 2010 the State Armaments Program for 2011-2020 (Russian: GPW 2020) was approved. According to its assumptions 19 trillion rubles (approx. 600 billion USD by the then exchange rate) was to be spent on the purchase of new weapons and on research and development in the field of new military technology. The goal was to increase the rate of modern weaponry in the Russian Armed Forces from approximately 10 per cent in 2008 to around 70 per cent in 2020. Among the equipment to be purchased using these resources was the following: the acquisition of 600 aircraft and 1,100 helicopters for the Air Force, approx. 100 ships for the Navy, including approx. 25 corvettes, 14-15 frigates and 24 submarines (including 8 Borei class with the capability of carrying intercontinental multiple warheads missiles of R-30 Bulava type and 2300 tanks, 2000 artillery pieces, and 120 Iskander-M launchers for the Land Army. The Russian strategic forces were to receive new types of weapons (RS-24 Yars missiles, RS-12M1/2 Topol-M). Similarly, the air defense units expect deliveries of approx. 400 S-400Trumph and 100 S-500 Triumphator-M systems. GPW 2020 is part of a wider process of transformation of the Russian Armed Forces launched following the war with Georgia in 2008. Its aim was to move away from the Soviet army model based on mass mobilization in favor of smaller and more professional Armed Forces, characterized by higher combat readiness. 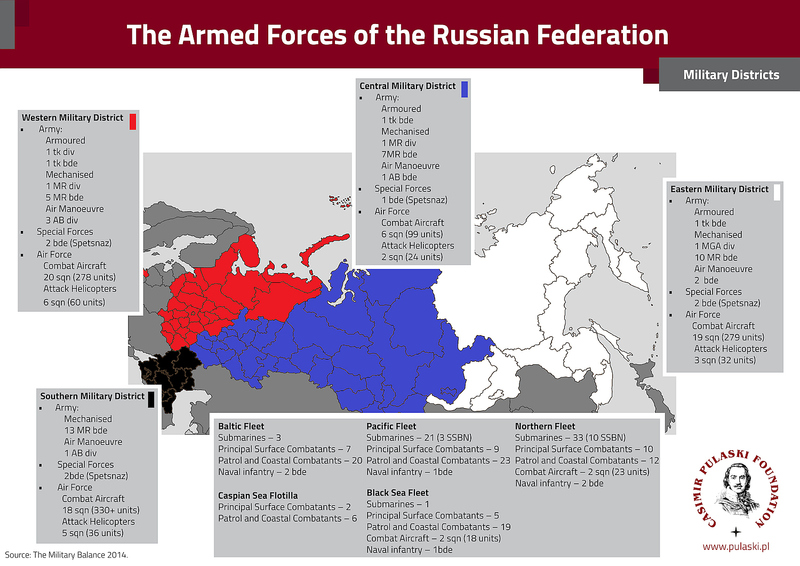 As a result of this transformation the division-type structure of the Russian land forces has been replaced by a brigade-type one, the number of military districts have been reduced from 6 to 4 (as of today these are: the West, South, Central and East), and the number of the commanding staff has been decreased. · 8 Borei class submarines with R-30 Bulava missiles(3 of 955 project and 5 of 955A project, to replace the 3 submarines of Kalmar class and 6 Delfin class). · At least 8 Yasen submarines (project 855/855M), capable of carrying missiles and replacing Barracuda, Kondor and Antyey submarines. · 3 submarines project 955 (Yuriy Dolgorukiy, Alexander Nevsky and Vladimir Monomakh) have been launched. 3 submarines, project 955A, have started to be constructed. · 1 submarine project 855 has been launched (its construction was started in 1993); the other 2 are under construction. Due to the disastrous state of the Russian nuclear submarine fleet and its special role in the system of deterrence, the program of building new nuclear submarines seems to be one of the priorities. The matter of Bulava missiles (officially 8 of approx. 20 attempts have failed) remains, however, problematic. · 6 conventional submarines -project 636.3 “Varshawyanka” (Improved Kilo). · New submarines – project 677 Lada. · 3 submarines, project 636.3, have been launched for the Black Sea Fleet; the remaining 3 units are under construction. · The prototype, project 677 Lada, submarine have been completed (the next 2 are under construction). The program of implementation of 6 new submarines to the Black Sea Fleet is likely to be realized. Numerous technical problems occurred in the case of the first Lada submarine, although the project is to be continued. · approx. 25 new corvettes · 2 frigates, project 22350 (the construction of 2 more has started), and 2, project 11356M (the keel has been laid for 3 more). · So far the construction of 4 project 20380 corvettes has been completed and 2 ships, project 20385, have been started and 3 small corvettes, project 21631 Buyan-M, have been launched (5 more are under construction) A program to strengthen the surface fleet, despite the significant delays in the construction of a prototype unit, project 22350, has run smoothly; there was little evidence to suggest it would fail. Problems may occur with corvettes class Buyan-M due to the interruption of supplies of the German engines. Similar problems may occur with project 20385 corvettes, and even project 22350 frigates (their power plants were provided by Ukraine). The Russian side declares that there will be no problem with the replacement, however delays in realisation of the projects are to be expected . · Introduction of a fighter of the 5th generation -Sukhoi T-50/ PAK FA – developed with Indian involvement – and built in stealth technology (by 2020 55 fighters will be launched). · Approx. 600 new combat aircraft. · 5 new prototype PAK FAs have been built (3 are under construction). · Programs are being realized to acquire new aircraft, including: Su-30SM (72 aircraft have been ordered, approx. 30 have been delivered) Su-30 M2 (16 ordered, approx. 10 delivered), Su-35S (48 ordered, approx. 30 delivered), Mig-29SMT (16 ordered) and Su-34 (contract realization is in process for 92 aircraft, approx. 30 were delivered). So far, the serial production of PAK FA aircraft has not started, and the prototypes in use have struggled with technical problems. According to the manufacturer’s assurances, deliveries will begin in 2016, and by 2020 55 aircraft will be delivered. However, new machines are systematically introduced, based on older designs (e.g. new variants of Su-27). · approx. 1100 new machines. · Implementation of approx. 400 modern combat helicopters -Mi-28N (150 machines), Ka-52/Ka-52K (180 machines), Mi-35M (49 machines). · The modernization of the transport helicopters fleet is in process. · Air plants in ArsenievandRostvertol have so far delivered annually several Mi-28N and Ka-52 to the Russian army. The program to provide new helicopters may be at risk due to the suspension of cooperation between the Russian and Ukrainian industries (Ukrainian plant Motor Sich delivered engines including for Mi-28N and Ka-52). · Approx. 2300 modern tanks. · Implementation of new generation combat vehicles–tank T-14 “Armata”, Kurganiec-25 vehicle and the APC Bumerang. · The advancement activities of “Armata” tank are in process (Uralwagonzawod) and Kurganiecvehicles (OAO Kurganmzaszzawod) and Bumerang (OAO AMZ plant). Russian decision makers assure that by 2015 the land army will receive first part of new vehicles. · The modernization of T-72 tanks is in process (modernized T-72 have replaced T-80B/T-80BW/T-80U). The construction of new modular platforms will probably be delayed. This is indicated by the announcements of the resumption of purchase orders for infantry combat vehicles BMP-3 and modernization of tanks T-72 to the T-72B3 version. 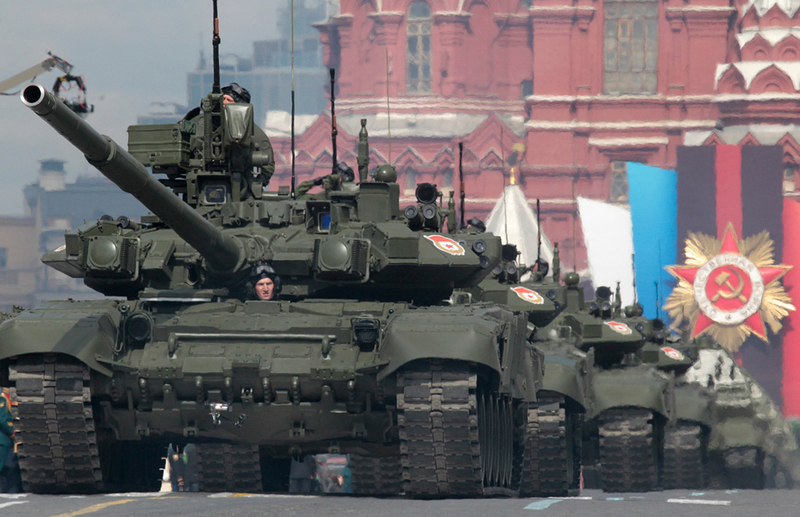 There were reports that the price of the new tank is unacceptable for the Russian Defense Ministry, and the resignation from the “Armata” program is probable. · Developing a system of individual weapon and equipment · The ongoing state tests of the prototypes are supposed to be executed in field conditions in 2015. The end date of the project was shifted multiple times. Because of the involvement of the French industry further delays are to be expected. · 120 Iskander-M launchers to replace approx. 200 Tochka launchers. · So far 5 brigades have been equipped with Iskander-M Missiles (60 launchers with 2 rockets each). · Work is underway on the Iskander-K system, capable of firing missiles with a greater range. The program of rearming the Russian units with Iskander-M systems seems to be proceeding smoothly and is likely to be realized. · Arms for 28 regiments (16 launchers each) equipped with S-400 Triumph systems. · 100 launchers S-500 Triumphator-M. · So far 9 regiments have been equipped with S-400 systems. · The last stage of research and development of the S-500 system is under way (according to the announcement, it is to be completed in 2015.). The introduction of new S-400 launchers has so far proceeded quite slowly. There was also conflicting information as to the number of systems introduced so far, which may indicate that Russian industry is experiencing problems realizing orders. · Replacing older missiles RS-18B and RS-12M Topol with modern RS-24 Yars and RS-12M1/2 Topol-M.
· Modernization of aircraft Tu-160 iTu-95MS. · Approx. 80 Topol-M missiles and approx. 50 Yars missiles have been introduced. · The first out of 10 Tu 160s has been modernized (in 2015 the next 6 are to be modernized) and 9 Tu-95s. Replacement of Russian missiles carrying nuclear warheads is consistently implemented. As in the case of nuclear-powered submarines the program appears to be a priority. 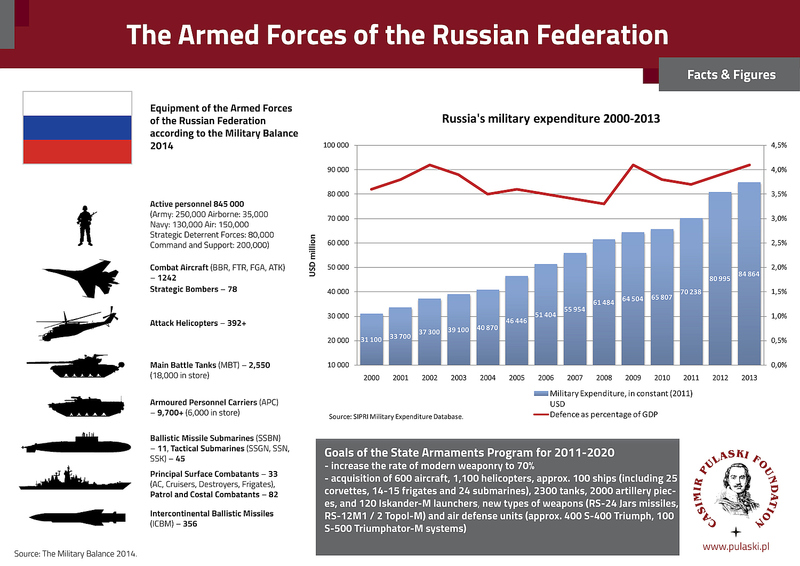 Chart: own work on the basis of the Military Balance 2014 and statements by the Russian authorities and arms companies. The success of the modernization program of the Russian Armed Forces caused certain doubts from the beginning; for example, due to pervasive corruption in the Russian army. In July 2012, as a result of the corruption scandal, defense minister Anatoly Serdyukov, who oversaw the program, was dismissed (he was replaced by Sergei Shoigu: a former minister for extraordinary affairs and a close associate of Vladimir Putin). Along with Serdyukov his deputy, Alexander Sukhorukov, was also dismissed, as well as the chief of the General Staff of the Russian army Nikolai Markov. The negative consequences of the ongoing conflict in Ukraine, both political and economic, certainly pose a far more serious threat to the modernization program of the Russian Armed Forces. The suspension of the Ukrainian defense industry’s exports to Russia is a direct consequence of the annexation of the Crimea and military support given by the troops of the Russian Federation to the rebels in eastern Ukraine. Until the outbreak of the conflict in the Donbass Ukraine had been a key provider of specialized military components and services used by the Russian army (for instance, Ukrainian arms plants had been engaged in maintenance of Russian intercontinental ballistic missile RS-20W “Voevoda”, elements of RS-18 and RS-12M Topol missiles, and were responsible for the production of guidance systems for the basic air-to-air missiles used by the Russian aviation – R-73 and R-27). One of the biggest challenges for the Russian defense industry will be self-sufficiency in the production of aircraft engines. One of the main suppliers of power units for Russia was Motor Sich in Zaporizhia, which was responsible for the production of TW3-117 family engines. These units are used in most of the helicopters used by the Russian Armed Forces, and their upgraded versions are used in the latest Russian combat helicopters, including Mi-28N, Ka-50 and Ka-52. It should be stressed that Ukraine had been supplying Russia with more than 400 engines per year, which calls into question the production capacity of the Russian industry in the context of its ambitious plan to modernize the fleet of helicopters. The realization of the program of the Russian Armed Forces modernization is additionally hampered by the imposition of sanctions by the European Union and the United States. These markets are not critical from the perspective of Russian arms exports (in 2011-2013 Russian arms exports to the EU countries amounted to only 75 million USD). The Russian military faces the problem of replacing advanced military technologies, especially electronic and optoelectronic, and the dual-use technologies it previously obtained from Western Europe. EU countries have also suspended the execution of contracts drawn up before the imposition of sanctions (such as the sale to the Russian Federation of the French amphibious assault ships Mistral type). Similar measures have also been taken by Germany; MTU Friedrichshafen has ceased the supply of engines for the Russian missile corvettes Project 21631-M Buyan class. The government in Berlin is also behind Rheinmetall AG’s decision to suspend the construction of a training center for the Russian army in Nizhny Novgorod. In addition, U.S. sanctions have impacted the Russian Armed Forces modernization plan, especially in the context of the U.S. influence on non-European allies (affecting, for example, Israel’s export policy). All this indicates that Russia needs to become self-sufficient as far as military technology is concerned. Further enhancement in economic cooperation with Belarus and China should also be expected. The latter possesses suitable resources, both scientific and financial, for realization of projects concerning the development of new technologies. The embargo on military technologies and dual-use technologies will certainly raise the cost of the GPW 2020. This is all the more important in the context of the economic dimension of EU sanctions and the decline in oil prices on world markets. Economic sanctions will probably have the strongest impact on the Russian economy, such as restricted access to the EU market for financial instruments (with a maturity of more than 30 days), including the Russian state-owned banks (Sbierbank, VTB, Gazprombank, Vnesheconombank and Rossielchozbank, as well as their subsidiaries), and the largest companies in the energy sector (Rosneft, Transneft, Gazprom Neft) and defense (UralVagonZavod, Oboronprom, United Aircraft Corporation). The European Union has also introduced a total ban on loans for the five Russian state banks. Restrictions also apply to the export of technologies and services relating to the exploration and production of subsea and Arctic energy resources. Oil is undoubtedly the foundation of the Russian economy and, indirectly, of the budget of the Russian Federation (in 2013 profits from the sale of crude oil and natural gas accounted for 68 per cent of total exports of the Russian Federation, and the energy sector provided over 50 per cent of the federal budget revenues). Although crude oil and natural gas until recently were considered to be Russia’s “two allies”, the current energy prices are one of the main sources of Kremlin uncertainty. Whereas in 2011-2014 the price of a barrel of crude oil fluctuated around 90-110 USD, it has now reached a record low of less than 50USD. The World Bank’s latest forecasts indicate that the Russian economy could shrink by as much as 2.9 per cent in 2015. Capital outflow and a sharp decline in the value of the ruble account for yet another blow to the Russian economy. The gravity of the situation can be seen in the decisive action taken by the Russian Central Bank, which at the end of 2014 decided to raise interest rates for the fifth time that year. The increase of the base rate by the Central Bank of Russia by 6.5 percentage points (to a level of 17 per cent) should be considered a drastic attempt to defend the ruble. The situation has only been exacerbated by the increasing inflation, which will have its repercussions on both ordinary citizens and the state budget. The modernization of the army will, however, be one of the last areas in which the Russian Federation will introduce cuts. Defense spending is not only a mean to rebuild the military potential of the Russian army but also an opportunity to strengthen the domestic industry. Given the desire for independence in the production of the most advanced combat systems components used by the Russian Armed Forces, this prioritization is justified. If the current economic situation does not change, it can be expected that, in the longer term Russia will be forced to review its previous assumptions of GPW 2020 and reduce defense spending. The currently ongoing work on the Russian Armed Forces’ modernization program in years 2016-2025 (the program is supposed to be approved by the end of 2015) shows a conflict between the Russian Finance Ministry which opts for lowering and rationalizing spending and the Defense Ministry which insists on keeping the planned spending or even rising it. Despite numerous problems, since 2008 Russia has consistently pursued the ambitious transformation plan of its army, into smaller and more professional armed forces, characterized by higher combat readiness. One of its essential elements is the technical modernization of Armed Forces (the goal of the National Armaments Program – GPW 2020 worth 19 billion rubles, is to increase the modern weaponry rate to approximately 70 per cent in 2020). Technical modernization of the Russian army has gone well in those areas where upgraded weapons systems are being introduced, based on solutions from the times of the Soviet Union (advancement variants of Su-27 and Mig-29 aircraft, Kilo-class submarines). However, there are problems with prospective weapons development programs (PAK FA aircraft, ‘Armata’ tank, ships – project 677 Lada, Bulava missiles). Western sanctions imposed on Russia and the breaking of cooperation with the Ukrainian defense industry may hamper and increase costs of GPW 2020. For the Russian Federation this will mean the need to strive for self-sufficiency in military technology. If the current economic situation does not change, one can expect that in the longer term Russia will be forced to review its previous assumptions of GPW 2020 and reduce defense spending. The modernization of the army will, however, be one of the last areas in which the Russian Federation will introduce cuts. The Northatlantic Alliance should closely monitor the progress in realization of the Russian military modernization program. Taking into account that NATO is indicated by the Russian strategic documents as the greatest threat to the Russian Federation, the organization should strengthen its capabilities in the field of territorial defense of the member states and its potential of deterrence. In this context it is necessary to quickly complete the provisions of the Newport summit (especially in the domain of the Immediate Response Forces – VJTF, a constant, rotating presence of the Alliance on the NATO border states territories, as well as in achieving by the member states the recommended level of 2 per cent of GDP spending on defense within 10 years). The tactical nuclear weapon deployed in Europe under the NATO Nuclear Sharing should be maintained and modernized. Both the modernization of the Russian Armed Forces and the increasingly aggressive policy of the Kremlin are the most significant threats to Poland’s security. Poland has to complete its own Technical Modernization Plan of the Armed Forces consistently and without delay. Taking into account the shape of the Russian military modernization program, the emphasis should be placed on air and anti-ballistic missile defense, combat aviation, armored and naval defense systems. Defense spending at the level of 2 per cent GDP in the case of Poland is the absolute minimum and in the medium term, its further increase should be considered.